A Disgruntled Republican in Nashville: Self promoters, Scams, Hustlers and opportunist on the right. Contributors beware. Self promoters, Scams, Hustlers and opportunist on the right. Contributors beware. As of the last report March 31,2014, Patriots for Economic Freedom had raised $224,747 and spent $215,015 this year. $119,501 of what they spend was for "unclassifiable consulting," $18,849 for Accountants, compliance and legal service, and a little over $25,000 on fundraising. Amagi Strategies was paid $109,856. Only $3,125 was spend for or against candidates. Today I got a solicitation from Conservative America Now asking me to send them a donation to help reelect Senator Mike Lee. Mike Lee is another Senator who I like and admire and want to see reelected. I will not be sending money to Conservative America Now, however. Conservative America Now as of the last filing period of March 31, 2014 had receipts of only $16,541 and expenditures of $12,140. They have not yet spend anything on or against candidates. Amagi Strategies was paid $7100. I don't know if Mike Lee has a serious primary challenger or not, or if he is likely to have a serious Democrat challenger. If he does, I may send Mike Lee a modest contribution but I will send it directly to his campaign are a trusted PAC and not to Conservative America Now. There may be as many hustlers and opportunist on the left as the right, but I don't know the left. It angers me to see passionate political activist give their hard earned money to support the cause when they are being taken advantage of and the money they give goes to support some one's little political empire and maybe none of it goes to support the candidate they think they are supporting. Please find out who you are giving to before you give. There are a lot of PAC's and organizations that are effective and influential and have integrity and most of what is given actually is spend on behalf of the candidate for which they claim to be raising money. Please do a little research before giving. One good source for finding out how good an organization is, is Open Secrets. Below is the solicitation I got today urging me to contribute to Conservative America Now to support Mike Lee. I have disabled the links so no one will accidentally contribute to that organization. Mike Lee Has Been A True Conservative Hero In The Senate! His Re-Election Is Vital To The Conservative Movement! Mike Lee is a true conservative hero. In the Senate, Mike Lee has battled Harry Reid and Barack Obama's liberal agenda every step of the way. Mike Lee is making a big difference in the Senate. He needs your support to keep up the fight! Please contribute $25, $50, $100, $250, $500, $1000 or more today for voter outreach and advertising to help re-elect Mike Lee to the U.S. Senate! In the Senate, Mike Lee has fought to repeal ObamaCare, reject all amnesty efforts, and cut out of control spending. Mike Lee is also working hard to lower taxes, bring back limited government, and protect the Second Amendment. He refuses to allow liberals to destroy the constitution! Please contribute $25, $50, $100, $250, $500, $1000 or more for voter outreach and advertising efforts to re-elect Mike Lee. Liberals know that Mike Lee will fight against radical attempts to pass amnesty, grow the government, and increase debt. The left will stop at nothing to beat and silence Mike Lee. Liberals are already working hard to discredit Mike Lee and take back his seat. This election will be one of the most important in recent memory and Mike Lee needs your support. Please contribute $25, $50, $100, $250, $500, $1000 or more to support Mike Lee with voter outreach and advertising! Mike Lee is dedicated to fighting the radical liberal agenda in Washington. He will stop the out of control spending and put an end to the left's trampling of the constitution. He will continue to bring conservative leadership to the Senate and stand up for limited government policies. Mike Lee has proven that he will hold Washington accountable! This race can help end the radical liberal agenda in Washington! 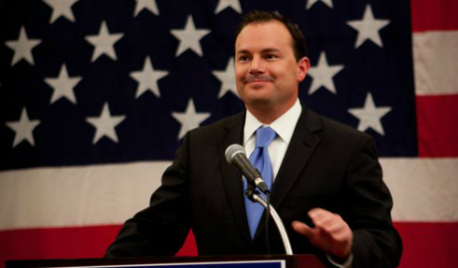 Help keep conservative hero Mike Lee in the Senate!